LAS VEGAS—JBL Commercial by HARMAN today introduced the all-new VMA Series mixer/amplifiers, developed specifically for global markets demanding cost-effective solutions for commercial audio installations. Perfect for applications in emerging markets that require quality equipment at an affordable price, VMA Series mixer/amplifiers feature both 70V and 100V output with convenient features for flexible global use. 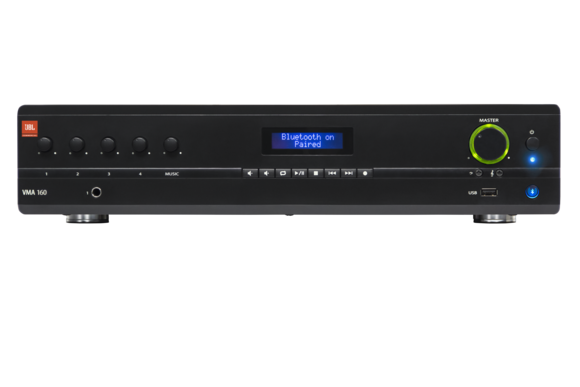 The VMA Series incorporates a number of convenient and flexible features, including a Bluetooth and USB media player; low impedance functionality (4 ohm/8 ohm) and high impedance output (70V/100V); independent bass and treble controls for each output channel; paging chime; and priority muting. Rack-mounting hardware is also included.